Find the Weekly Cub Foods Ad, valid Thursday April 18 – Wednesday April 24, 2019. 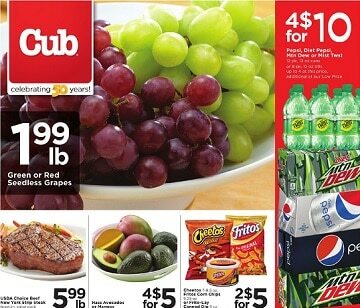 Don’t miss the Cub Foods Sale Specials for this week, Friday freebie digital offer and bakery offers. Find savings for Perdue Fresh Chicken Drumsticks, Nectarines or Peaches, Applewood Sliced Bacon, USDA Choice Beef Boneless Chuck Roast, Jack’s Original Pizza, Essential Everyday Canned Beans, Large Snow Crab Clusters, Parmesan Pasta Salad, Green Kale, Yellow Squash or Zucchini, Organic Raspberries, Wild Harvest Fresh American Lamb Chops, Purina Beneful Dog Food, Degree Ultra Deodorant, and more.